On Monday I took the day off work. I thought I would treat myself and have a day of leisurely art viewing. First up was the Rain Room which I have been dying to see. I turned up half an hour after opening only to have my heart sink through the floor. The line was two freakin hours long. Two hours long on a Monday morning just after opening? What the hell, is the rain made of gold or something? I took it as a message from the universe and didn’t wait. I instead went outside in the actual rain and journeyed on to my next stop. On to the V&A to see the Hollywood Costume exhibition. It is an exhibition featuring 100 famous costumes from movies such as Titanic, Fight Club and the Wizard of Oz. Shaking off my Rain Room failure, I rocked up to the entrance to be told that I needed to buy tickets from the main desk. Ok, no problem. Walk through the vast V&A to the main desk only to find the queue for tickets winding down the corridor. Now I was probably being a little over-sensitive to long lines, but I threw a mental tantrum and got the hell out of there. Time for take three, the National History Museum. As I exited the tube I came across the magical sight above. 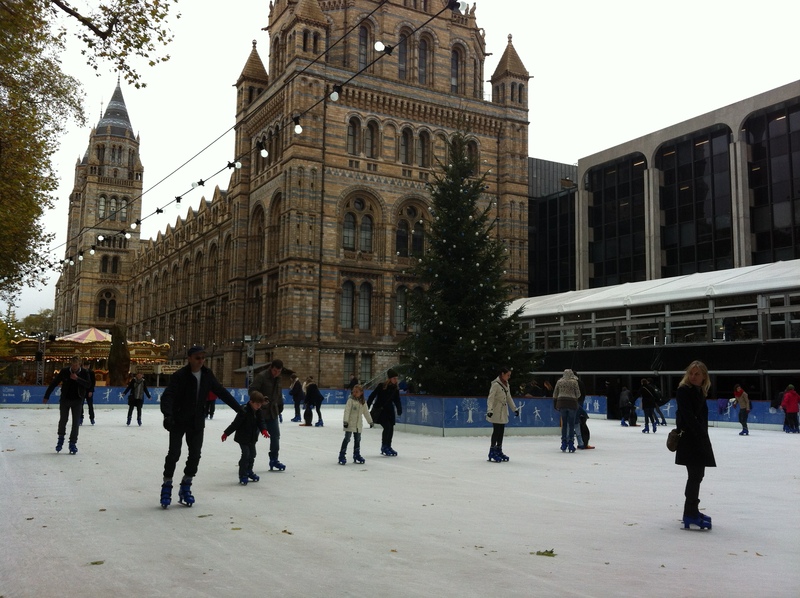 Children ice-skating around a Christmas tree with the Cathedral of Natural History in the background. For me this moment marks the official start of Christmas. Particularly magical for someone who has only ever seen a summer Christmas – in New Zealand we are far more likely to be at the beach with Santa in shorts and a sun-hat So although my day lacked art, it was full of Christmas cheer. It’s awesome to pay a visit this website and reading the views of all friends regarding this paragraph, while I am also zealous of getting know-how. Hello there, I am new to running a blog and internet sites in general and was curious about how you got the “www” included in your web address name? I see your domain, “https://runawaykiwi.com/2012/11/16/my-disaster-of-an-art-day/” has the www and my domain looks like, “http://mydomain.com”. I have no idea sorry – it just is the way it is!